From left, Highland County commissioners Gary Abernathy, Jeff Duncan and Terry Britton sit in session during their weekly meeting Wednesday. The Highland County Board of Commissioners has agreed on a labor contract with the Highland County Sheriff’s Office, and the contract is set to be approved in coming weeks — with or without the signature of Sheriff Donnie Barrera, who refused to sign the document. 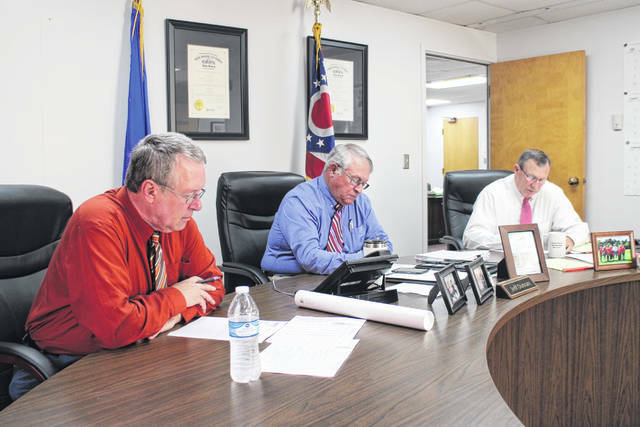 Highland County Commissioner Jeff Duncan said at the commissioners’ weekly meeting Wednesday that the county on Monday reached an agreement with the Fraternal Order of Police, the union that represents the sheriff’s office, on a two-year labor contract. Duncan, who has taken the lead on union negotiations for the commissioners, said the contract is retroactive to January, and includes a two-percent raise for all sheriff’s office employees. Barrera said Wednesday afternoon that he did not sign the contract. The sheriff declined to say why. Duncan declined to comment on why Barrera refused to sign the document. The commissioners met with Barrera and Highland County Auditor Bill Fawley in executive session Wednesday morning to discuss contracts. The board took no action afterward. Whether or not Barrera signs the document, Duncan said the agreed contract “will be enforced,” since the sheriff’s signature is not required for the contract to take effect. The contract is set to be ratified by the FOP on July 25 and signed by the commissioners on Aug. 1, Duncan said. In other matters, the commissioners continue to see a substantial decline in sales tax revenue. According to a spreadsheet created by Highland County Auditor Bill Fawley, the county so far this year has lost a total of $418,129 in permissive sales tax revenue. The drop is attributed to a federal law change prohibiting states, counties and transportation authorities from collecting sales tax on Medicaid-funded managed care organizations. Fawley said sales tax revenue always experiences a dip in the last three months of the year, and he expects the same in 2018, leading to a “sizable shortfall” at the end of the year. Duncan said commissioners will meet individually with county department heads to review budget requests for 2019 and take the appropriate action. Commissioner Terry Britton said the ongoing expense of foster care in the county weighs heavily on county finances, and county officials have learned the cost of juvenile detention has increased. Duncan said due to changes at the juvenile detention center whose services the county utilizes, there may be some relief from the detention cost soon. Highland County Health Commissioner Jared Warner said the board of health has approved a 0.5-mill levy to be placed on the ballot in November. If approved, it will replace the board’s current levy, which was approved in 1989. Warner said it’s “hard to run a modern health department” on the same level of funding as it received in 1989. Warner said he would give commissioners more information next week. Commissioner Gary Abernathy said the county will be in touch with Department of Justice officials in coming days to “see how much leeway we have” in revising the budget for an $844,000 federal economic development grant for the Rocky Fork Lake area. Abernathy said such grants are often awarded to larger counties, leading federal officials to question staffing capabilities for administration of the grant here after it was initially awarded. Abernathy said state Rep. Shane Wilkin, who took the lead on the grant as a county commissioner, will help with the process. Duncan said construction crews will begin replacing the roof on the Highland County Courthouse on Aug. 3. During construction, which is expected to last one week, the front entrance to the courthouse will be closed, Duncan said. Those with business in the courthouse should enter through the door in the rear of the building. Commissioner Terry Britton said Highland County Engineer Dean Otworth is communicating with AEP Ohio about the energy company leasing a county parking lot near the engineer’s office as a staging area for an extensive energy infrastructure project. Britton said the lease would be for two years, and would be issued by the commissioners. The board also appointed Highland County Probation Department Director of Clinical Services Tonya Sturgill as the county representative on the Paint Valley Alcohol, Drug and Mental Health Board. Sturgill will replace Jeremy Ratcliffe, former probation department director.